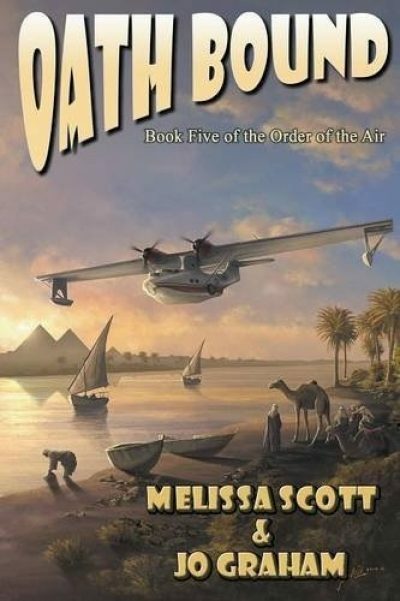 2016’s Oath Bound is the fifth installment in Melissa Scott and Jo Graham’s ongoing series, Order of the Air . History books may later claim World War Two did not properly begin until 1939, but the opening shots are already being exchanged in 1935. Germany is busy re-arming. Italy has revealed the essential meaninglessness of League of Nation ideas as its invasion of Ethiopia continues, unopposed by any save the Ethiopians and a handful of volunteers. Some volunteers join the struggle of their own choice. Others, like Jerry Ballard and his friends, are recruited. Ballard is in Cairo, on the track of Alexander’s long lost tomb, when Ballard’s old friend Ras Iskinder comes to him in desperation. Emperor Haile Selassie had the foresight to order arms and ammunition against Italy’s next attack. Now the attack has come but, thanks to interference from Italy’s agents in North Africa, the munitions are still stuck in transit. Iskinder appeals to his old friend for assistance. Ballard cannot himself transport Iskinder’s cargo, but his friends (Alma, Mitch, Lewis, and Stasi) can. Alma and Mitch co-own Gilchrist Aviation. and, as luck would have it, she and her team are in Europe at this very moment. They have entered an airshow with an airplane that could have been custom-made to move important cargos to the middle of nowhere on virtually no notice. There are complications. There’s Himmler and the ring of power Stasi notices on his finger. There’s the fact that Alma and her friends are flying into a very real (if undeclared) war zone. And there’s the fact the determined man who blackmails his way onto Alma’s plane is none other than Count von Rosen, Hermann Göring’s nephew! In an earlier review I mention that certain figures have plot immunity, because Scott and Graham are using historical figures whose deaths are a matter of record and not scheduled to occur until long after the series. In this book, that works in Alma and company’s favour somewhat: Carl Gustav von Rosen—aviator, humanitarian, mercenary—did not die until 1977. Having him on board with Alma provides a pretty good guarantee that the 1930s mission of mercy to Ethiopia won’t end in a ball of fire at 10,000 feet. At the same time, the Second Italo-Ethiopian War is also written into the history books; the heroes can make small differences here and there, but in the end, Ethiopia can only end up occupied by the Italians. Well, at least until 1941…. There is a lot going on in this book; an airshow, Axis shenanigans in Europe, Ballard’s quest for the tomb in Cairo, and the war in North Africa. The various plot threads do end up entangled, but the general effect is a bit scattered. Still, I am enjoying the Order of the Air adventures. Even though I know events can only get grimmer, I am curious as to where all this will lead. Oath Bound is available here. It belatedly occurs to me that this is exactly the sort of fantasy with a diverse cast many readers are looking for. I almost failed to mention that because I expect Scott and Graham to have casts of all races and orientations. Of course, not all readers will be familiar with that aspect of their work. If you’re looking for protagonists who are not the usual sort of cisgender white male, consider checking out these books.